Bringing together a fascinating range of contemporary statement rugs, the Rustic Textures featured collection by Nourison is a striking way of adding something new to your home. The Rustic Textures range have an elegant yet urban feel and are a perfect addition to many different styles of home. The brand themselves describe the rugs as “at home in a country cabin or urban loft” and each one has a real artistic flair at the heart of its design. 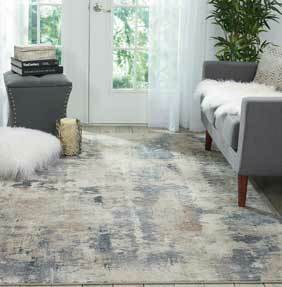 There is an almost splashed canvas or painter’s studio feel to many of the rugs in the Rustic Textures collection. Many of the rugs in the collection have a distressed look too with the bold colours slightly washed out, making them an ever better fit for a range of different interiors. Like many rugs in the Nourison collection, the pile is easy to care for and durable, while still offering warmth and comfort. Subtle textures enhance the overall look and feel of each rug and give the collection its unique and urban feel.